The Compulsive Reader: Cover Talk: Grace Cover Reveal! If you are a frequent reader of this blog, you probably already know of my love for Elizabeth Scott's books. I really, really, really, really, really, really love her books. 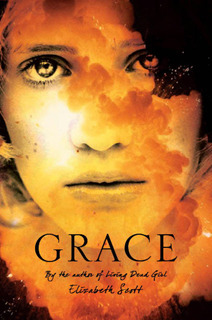 She's already proven herself to be a versatile and diverse author in my eyes, and the release of her Fall 2010 book, Grace, only emphasizes this. It looks like where she previously hung out in the contemporary, romantic reads with a few forays into some more serious topics, with Grace, Scott is going off in a completely new direction...science fiction. A fable of a terrifying near future. Sounds really fascinating, right? The suicide bomber part of the description makes the cover make a little more sense now. I will admit, when I first saw the cover, I wasn't too keen on it. Now it is growing on me, and I like it. I like the simplicity of the title's font as well. I can't wait. What do you think (about the cover and ES's new book)? I've loved her books and this sounds marvelous! I hadn't previously read the description so I am really glad to see that tidbit on the post. I can't wait to see how ES handles sci-fi. First off I love the cover as it is so very intriguing! Secondly, the plot sounds absolutely fantastic and I cannot wait to read it. This sounds sooooo good! And I love the rawness of the cover. Its so different that most ya books. It pulls at my heart already! Ooh! I hadn't seen this yet. It sounds great! I love Elizabeth Scott, too. I loved that Living Dead Girl was such a departure for her, and I am so interested that she is trying something new with this one! She's awesome. I am in such awe of her. I buy her books no matter how much they charge for shipping because I know one can never go wrong with her books. This one looks so different but I am sure she will weave her magic through it ..
Obviously I am mega excited! As you know I am a huge dystopian fiction junkie, and I was quite impressed by the one ES book I read (I haven't read most of them, because I am just not into the teen romance genre). Oooooooh. This sounds good. I usually sort of love/hate ES's books. It's because I love the realism and the honesty I see in the relationships she puts on the page, but sometimes I'm really frustrated by certain characters. But a jump into sci-fi? That sounds absolutely perfect. Can't wait to read this!